Saudi Arabia electronic security market is expected to witness robust growth by 2021, fueled by growing construction market in the region. Demand for electronic security systems in the country is further boosted by increasing awareness among the consumers for security products. According to 6Wresearch, Saudi Arabia's electronic security market is forecast to grow at CAGR of 14.4% by 2021. Increasing IT security spending, government expenditure for infrastructure development, growing terrorist threats, and safety of physical assets and critical financial information are boosting the demand for electronic security systems in Saudi Arabia. Central region of Saudi Arabia is expected to contribute major share in electronic security market, as a result of major infrastructure development in the region. Video Surveillance is the fastest growing segment in Saudi Arabia electronic security market, followed by access control systems and intrusion detection systems. Government and transportation applications accounts for the largest share in 2014. However, growing commercial offices, banking & financial and retail sectors are also expected to contribute significantly in Saudi Arabian market over the next six years. The report thoroughly covers the electronic security market by types, components, verticals and regions. The report provides the unbiased and detailed analysis of the on-going trends, opportunities/high growth areas, market drivers, which would help the stakeholders to decide and align their market strategies according to the current and future market dynamics. •	Historical data of Global Electronic Security Market for the Period 2010-2014. •	Market Size & Forecast of Global Electronic Security Market until 2021. •	Historical data of Saudi Arabia Electronic Security Market Revenue for the Period 2010-2014. •	Market Size & Forecast of Saudi Arabia Electronic Security Market Revenue until 2021. •	Historical data of Saudi Arabia Video Surveillance Market Revenue for the Period 2010-2014. •	Market Size & Forecast of Saudi Arabia Video Surveillance Market Revenue until 2021. •	Historical data of Saudi Arabia Intrusion Detection Market Revenue for the Period 2010-2014. •	Market Size & Forecast of Saudi Arabia Intrusion Detection Market Revenue until 2021. •	Historical data of Saudi Arabia Electronic Security Vertical Market for the Period 2010-2014. •	Market Size & Forecast of Saudi Arabia Electronic Security Vertical Market until 2021. •	Historical data of Saudi Arabia Electronic Security Regional Market for the Period 2010-2014. 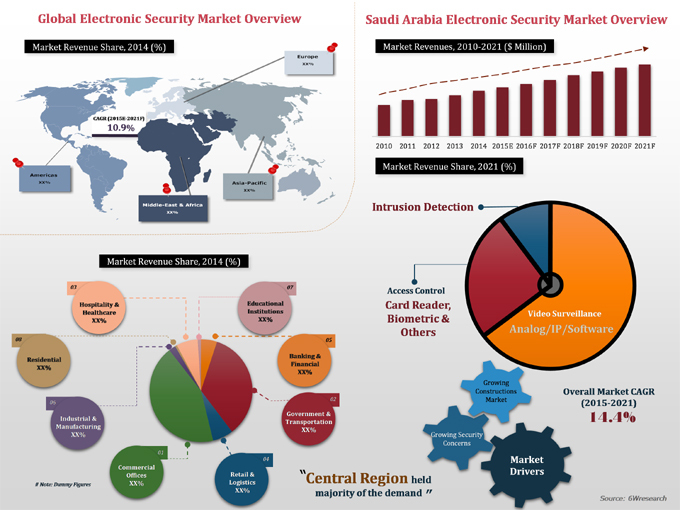 •	Market Size & Forecast of Saudi Arabia Electronic Security Regional Market until 2021. 13.2	Lenel Systems International, Inc.
13.4	Bosch Security Systems, Inc.
13.9	Hikvision Digital Technology Co. Ltd.
Electronic security market in Saudi Arabia is expected to witness robust growth during the forecast period on account of rapid growth in population, increasing investments in transportation projects, construction of commercial and retail centers and growing industrial base. Safety of infrastructures such as airports, metros, oil and gas facilities, residential buildings, etc., has spurred the demand for electronic security systems in Saudi Arabia. Video surveillance is forecast to be the fastest growing segment in overall electronic security market in Saudi Arabia. Major infrastructure projects, such as Riyadh metro and six economic cities would drive the market for electronic security systems in Saudi Arabia. The major companies in Saudi Arabia video surveillance market include- Axis Communications, Lenel Systems, Honeywell, Bosch Security Systems, Siemens, Pelco, Samsung Techwin, Tyco, Hikvision, Arecont Vision and Avigilon.